An ethics committee has been set up to tackle moral issues faced by Greater Manchester Police (GMP) and the area's police and crime commissioner. The independent committee is one of the first of its kind in the country and aims to make recommendations on moral and ethical dilemmas. It will look at issues such as surveillance operations and the use of body cameras and water cannon. Members of the public can make referrals to the committee. The panel of 13 is chaired by the Bishop of Manchester, the Rt Rev David Walker. It includes retired NBA basketball player John Amaechi - who has helped organisations deal with ethical issues - and Ruth Bromley, ethics and law lead at Manchester Medical School. 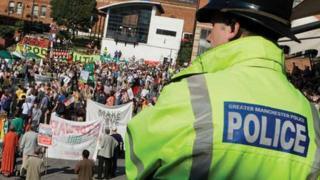 GMP Chief Constable Sir Peter Fahy said: "There are lots of grey areas in policing. "Our staff are faced with dilemmas over what is the right thing to do in a complex world where people can have very strong views on different sides of the fence." The committee will hold regular meetings. Smaller working groups are planned to look at specific day-to-day and wider issues such as stop and search and discrimination. It will work to deal with dilemmas such as when GMP was accused disposing of tissue samples from the victims of the serial killer Harold Shipman without relatives' knowledge. A spokesman for Greater Manchester's police and crime commissioner said the committee would look at such an issue and advise on how the force should act - such as whether it should notify families. Commissioner Tony Lloyd said: "Ethics and integrity go to the heart of good policing. "It's also an area that is increasingly in the spotlight due to high-profile cases - such as Hillsborough and the Stephen Lawrence murder - which have the potential to damage confidence in policing. "It also shows the public that police in Greater Manchester are serious about driving up standards." Committee members have been appointed for an initial two-year term. More than 120 people applied. The committee was chosen after shortlisted candidates were interviewed by a panel including representatives from GMP and the police and crime commissioner's department. Committee members will receive an allowance of £1,000 and an attendance allowance of £211.50 per day or £104.50 per half day, in line with Home Office guidelines. Body Cameras: Surveillance for surveillance's sake?